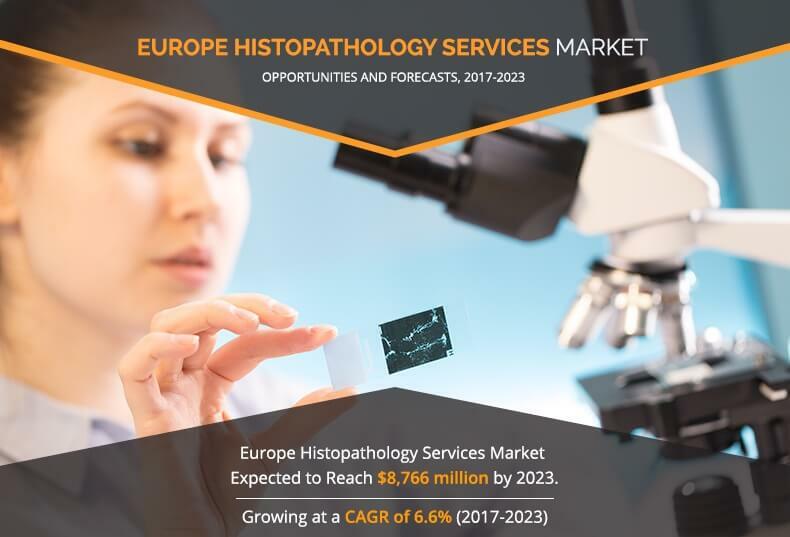 Increase in prevalence of cancer & other chronic disorders, rapid surge in geriatric population in Europe, and rise in public awareness towards disease screening drive the growth of the Europe histopathology services market. However, limitations of histopathology and dearth of pathologists & medical laboratory scientists in the UK are expected to impede the market growth. On the contrary, increase in demand for personalized medicine is expected to offer opportunities for market expansion during the forecast period. The Europe histopathology services market is segmented on the basis of type of examination and country. Based on type of examination, the market is classified into surgical specimen, gastrointestinal biopsy, breast biopsy, lung biopsy, biopsy of gynecological cancers, renal biopsy, pancreatic biopsy, skin tissue biopsy, liver biopsy, nerve biopsy, testicular biopsy, and others. By country, it is analyzed across Germany, France, the UK, Spain, and rest of Europe. Histopathological examination of a surgical specimen is performed when surgical resections are submitted by surgeons or non-surgeons, including medical subspecialists, dermatologists, and interventional radiologists. A surgical resection specimen is obtained via surgical removal of an entire diseased area or organ. Surgical resection procedures are often intended as definitive surgical treatment of a disease, which is pre-diagnosed or strongly suspected. A surgical specimen undergoes histopathological examination to confirm presence of previously diagnosed disease, stage or extent of the malignant disease, to ensure that the entire diseased area has been removed, to identify the presence of unsuspected concurrent diseases, and to provide information for postoperative treatment. Spain expends around 10% of its GDP on healthcare facilities, which constitute both private and public healthcare systems in the form of hospitals, healthcare centers, and state healthcare services. The public healthcare system is used by nearly 90% of the Spaniards. 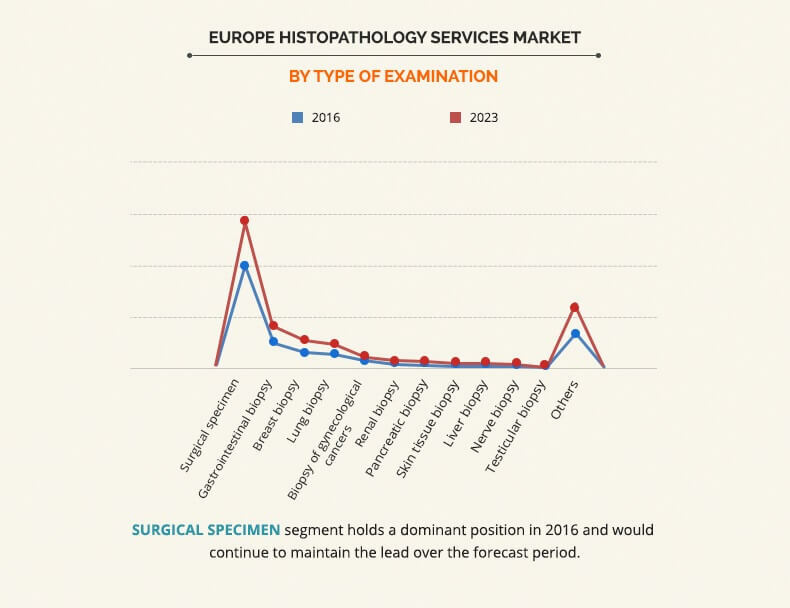 The Spain histopathology services market is expected to grow at a high rate, owing to increase in number of surgical procedures that require histopathology. 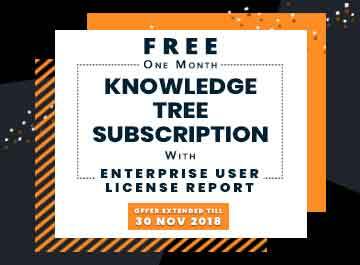 The list of key players profiled in this report include Acculabs Diagnostics UK Ltd., Cellular Pathology Services Limited, Great Ormond Street Hospital (GOSH) Laboratory, HCA Laboratories UK, Laboratoire Cerba, Sonic Healthcare Limited, Spire Healthcare Group Plc, Targos Molecular Pathology GmbH, TPL Path Labs, and Unilabs Group Services. Analysis by type helps to understand the various types of EHRs used by healthcare providers. 6.1. Acculabs Diagnostics UK Ltd. 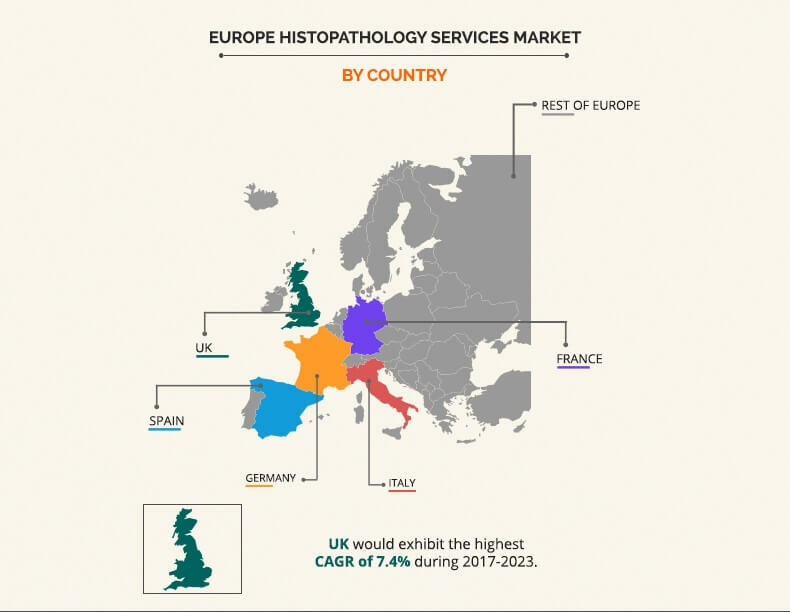 The adoption of histopathology services is expected to increase in the near future, owing to rise in prevalence of infectious diseases and cancer in the European region. Moreover, surge in demand for personalized medicine propels the market growth. The histopathology services market has gained traction among healthcare providers, as these tests help to diagnose a disease, stage or extent of a malignant disease, and identify the presence of unsuspected concurrent diseases. Moreover, these tests can be used to provide information for postoperative treatment in certain surgical procedures. In addition, rapid surge in geriatric population in Europe is anticipated to drive the market growth. Germany is expected to dominate the Europe histopathology services market during the forecast period, followed by France.